Author Lewis B. Patten (1915-1981), born in Denver, Colorado, served in the U.S. Navy from 1933-1937. Later, he was educated at the University of Denver and became an auditor for the Colorado Department of Revenue. It was in this 1940s period that he began his writing endeavors. His first novel, “Massacre at White River”, was published in 1952. It was the first of more than 90 western novels, three of which won Golden Spur Awards. 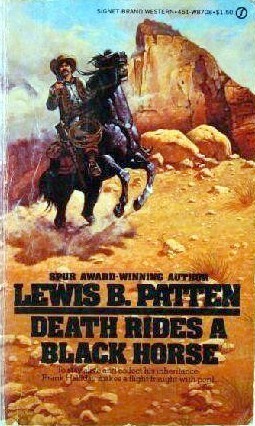 My first Patten review is a 1978 coming of age tale entitled “Death Rides a Black Horse”. We're introduced to 15-year old Frank Halliday and his father Walter. The two live on a sweeping 200,000+ acre ranch in Wyoming. The ranch foreman is Rafe and his second command is Standing Bear. This is important in the ranch hierarchy due to Walter's fatal fall from a horse. Frank attends the reading of the will and finds that his father has left a house and plenty of farm land to a neighboring girlfriend. The ranch and lucrative funds are trusted to Frank for distribution on his 21st birthday. Rafe, dedicating the majority of his life to the Halliday Ranch, is left with 5K and a lifetime job. The kicker – the entire spread goes to Rafe in the event of Frank's death prior to age 21. This opens the door for Patten's jealousy ridden murder narrative to fully develop. Frank, understanding Rafe's disappointment, senses that his life may be in danger. Soon, he's asked to ride out and check one of the springs. He's ambushed by two rustlers and forced to kill them in the attack. In his confusion, Frank runs away fearing that Rafe and Standing Bear will kill him upon his return to the ranch. The book drifts into Frank hopping trains, stealing horses, befriending Cherokees and eventually meeting the love interest Susan. This middle portion reads like a brisk adventure tale. The book's final quarter has Frank shooting it out with more hired killers, realizing that his father's own money (remember the 5K to Rafe?) is being utilized to murder him. While the reader suspects the finale will be a whirlwind firefight in the mountains, it actually equates to a jail scene with an angry mob hungry for a lynching. How we get there is an interesting twist, proving that Patten had a few cards up his sleeve to avoid the generic western formula. Again, this is my first foray into the bibliography of Patten. Like my recent Frank Gruber read, I just find it amazing that so many great westerns and western writers are out there even when you look beyond genre cornerstones like Zane Grey, L'Amour and Johnstone. For me, I've already purchased six more Pattens and have read that some of his finest works are “A Killing at Kiowa” (1972) and “Ride a Crooked Trail” (1976). I'm on it! Excellent review. I would recommend Patten's BONES OF THE BUFFALO, about the tragic 1878 outbreak of the Cheyenne.